In high-purity form aluminum is soft and ductile. Most commercial uses, however, require greater strength than pure aluminum affords. This is achieved in aluminum first by the addition of other elements to produce various alloys which singly or in combination impart strength to the metal. Further strengthening is possible by means which classify the alloys roughly into two categories: non-heat-treatable and heat-treatable. The initial strength of alloys in this group depends upon the hardening effect of elements such as manganese, silicon, iron, and magnesium, singly or in various combinations. The non-heat-treatable alloys are usually designated, therefore in the 1,000, 3,000, 4,000 or 5,000 series. Since these alloys are work-hardenable, further strengthening is made possible by various degrees of cold working, denoted by the “H” series of tempers. Alloys containing appreciable amounts of magnesium when supplied in strain-hardened tempers are usually given a final elevated temperature treatment called stabilizing to insure stability of properties. The initial strength of alloys in this group is enhanced by the addition of alloying elements such as copper, magnesium, zinc and silicon. Since these elements singly or in various combinations show increasing solid solubility in aluminum with increasing temperature, it is possible to subject them to thermal treatments which will impart pronounced strengthening. The first step, called heat treatment or solution heat treatment, is an elevated-temperature process designed to put the soluble element or elements in solid solution. This is followed by rapid quenching, usually in water, which momentarily ‘freezes’ the structure and for a short time renders the alloy very workable. it is at this stage that some fabricators retain this more workable structure by storing the alloy at below freezing temperatures until they are ready to form them. At room or elevated temperatures the alloys are not stable after quenching and precipitation of the constituents from the super-saturated solution begins. After a period of several days at room temperature, termed aging or room-temperature precipitation, the alloy is considerably stronger. Many alloys approach a stable condition at room temperature, but some alloys, particularly those containing magnesium and silicon or magnesium and zinc, continue to age-harden for long periods of time at room temperature. By heating for a controlled time at slightly elevated temperatures, even further strengthening is possible and properties are stabilized. This process is called artificial aging or precipitation hardening. By the proper combination of solution heat treatment, quenching, cold working and artificial aging, the highest strengths are obtained. The heat-treatable alloys in which copper or zinc are major alloying constituents, are less resistant to corrosive attack than the majority of non-heat-treatable alloys. To increase the corrosion resistance of these alloys in sheet and plate form they are often clad with high-purity aluminum, a low magnesium-silicon alloy or an alloy containing 1 percent zinc. The cladding, usually from 2% to 5 percent of the total thickness on each side, not only protects the composite due to its own inherently excellent corrosion resistance, but also exerts a galvanic effect which further protects the core material. Special composites may be obtained such as clad non-heat-treatable alloys for extra corrosion protection, for brazing purposes, or for special surface finishes. Some alloys in wire and tubular form are clad for similar reasons and on an experimental basis extrusions also have been clad. Aluminum of 99 percent or higher purity has many applications, especially in the electrical and chemical fields. These alloys are characterized by excellent corrosion resistance, high thermal and electrical conductivity, low mechanical properties and excellent workability. Moderate increase in strength may be obtained by strain-hardening. Iron and silicon are the major impurities. Copper is the principal alloying element in this group. These alloys require solution heat treatment to obtain optimum properties; in the heat treated condition mechanical properties are similar to, and sometimes exceed, those of mild steel. In some instances artificial aging is employed to further increase the mechanical properties. This treatment materially increases yield strength, with attendant loss in elongation; its effect on tensil (ultimate) strength is not as great. The alloys in the 2,000 series do not have as good corrosion resistance as most other aluminum alloys and under certain conditions they may be subject to intergranular corrosion. Therefore, these alloys in the form of sheet are usually clad with a high-purity alloy or a magnesiumsilicon alloy of the 6,000 series which provides galvanic protection to the core material and thus greatly increases resistance to corrosion. Alloy 2024 is perhaps the best known and most widely used aircraft alloy. Manganese is the major alloying element of alloys in this group, which are generally non-heat-treatable. Because only a limited percentage of manganese up to about 1.5 percent, can be effectively added to aluminum, it is used as a major element in only a few instances. One of these, however, is the popular 3,003, which is widely used as a general-purpose alloy for moderate-strength applications requiring good workability (good for castings). Major alloying element of this group is silicon, which can be added in sufficient quantities to cause substantial lowering of the melting point without producing brittleness in the resulting alloys. For these reasons aluminum-silicon alloys am used in welding wire and as brazing alloys where a lower melting point than that of the parent metal is required. Most alloys in this series are non-heat-treatable, but when used in welding heat-treatable alloys they will pick up some of the alloying constituents of the latter and so respond to heat treatment to a limited extent. The alloys containing appreciable amounts of silicon become dark gray when anodic oxide finishes are applied and hence are in demand for architectural applications. Magnesium is one of the most effective and widely used alloying elements for aluminum. When it is used as the major alloying element or with manganese, the result is a moderate to high strength non-heat-treatable alloy. Magnesium is considerably more effective than manganese as a hardener, about 0.8 percent magnesium being equal to 1.25 percent manganese, and it can be added in considerably higher quantities. Alloys in this series possess good welding characteristics and good resistance to corrosion in marine atmosphere. However, certain limitations should be placed on the amount of cold work and the safe operating temperatures permissible for the higher magnesium content alloys (over about 3.5 percent for operating temperatures above about 150 F) to avoid susceptibility to stress corrosion. Alloys in this group contain silicon and magnesium in approximate proportions to form magnesium silicide, thus making them heat treatable. Major alloy in this series is 6061, one of the most versatile of the heat-treatable alloys- Though less strong than most of the 2000 or 7000 alloys, the magnesium-silicon (or magnesium silicide) alloys possess good formability and corrosion resistance with medium strength. Alloys in this heat-treatable group may be formed in the T4 temper (solution heat-treated but not artificially aged) and then reach full T6 properties by artificial aging. Zinc is the major alloying element in this group, and when coupled with a smaller percentage of magnesium results in heat treatable alloys of very high strength. Usually other elements such as copper and chromium are also added in small quantities. Outstanding member of this group if 7075 which is among the highest strength alloys available and is used in air-frame structures and for highly stressed parts and lathe turned forms. Metal ornaments designed to be worn have been made traditionally of gold, silver, copper, or alloys thereof. Because of the weight factor of the metals, the ornaments have had to be thin walled, two-dimensional, and small in scale. The ornaments also could decorate only parts of the body strong enough to support them. The purpose of this paper is to acquaint the reader with the advantages and disadvantages of utilizing aluminum as a material for construction of wearable ornaments. Aluminum does not always solder wall because of its oxide layer, so a welding method known as Tungsten Inert Gas (hereafter referred to as T.I.G.) is described and can also be useful while working in gold, silver and copper. All of the following information can easily be obtained from a multitude of written materials on aluminum and its use in industry today. To briefly acquaint the reader with the type of aluminum this paper deals with, the following description is offered. Seven major alloys of aluminum are achieved from the ore called Boxite, when it is combined with other materials such as zinc, magnesium, and copper. Each alloy has its own unique character and quality. The 1,000 series is very soft and commonly used in electrical wiring. IT can be forged forever and does not work harder. The 3,000 series is most often employed in castings. It has the highest success factor in solid, pit-free vacuum casting. The 50 – 51,000 series and the 60 – 61,000 series are what the construction industries depend an for long lasting, dependable building of airplanes, houses, ships, etc. These are also the alloys which weld most successfully. The Aluminum Welders Training Manual and Exercises is a little book which simply and clearly describes T.I.G. welding. The pieces completed for this paper were welded on a variety of are welding machines. Each machine had both an AC and a DC current as well as a high frequency switch and remote foot control. Because the pieces were constructed from thin sheet aluminum, only 50 to 75 amperes were utilized, but the machines were equipped with a minimum of 250. In industrial welding, the filler rod employed is usually an alloy of the base metal plus a stronger alloy so as to insure a strong bond. I chose to make filler rod from strips sheared from the metal the pieces were formed from so as to insure identical coloration in the weld. It proved to be strong enough for my purposes. 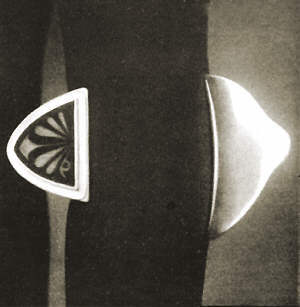 The advantages to using aluminum in making wearable ornaments are somewhat overshadowed by the disadvantages. Its weightlessness allows the designer to be free to work on a large, three-dimensional scale. Fantastic colors can be obtained by a plating-type process called anodizing. It can be etched effectively with Hydrocloric Acid molar no. 6 for best results. It can be forged and chased and embellished similarily to the more familiar metals. These advantages have their limitations however. For instance, each of the seven alloys annodize differently. So if a cast (3,000 series) is combined with a sheet (50 – 51 000 series) and then annodized black, the cast area will appear black, but the sheet area will appear blue-black. Achieving a flawless, mirror finish on a large surface area of an aluminum ornament is very difficult – especially if the area has been T.I.G. welded. Burnishing with steel or agat and oil can produce a nice mirror finish of edges and small surfaces. In annealing, soldering, or welding aluminum, the color never turns red, so knowing when the melting point is near is difficult to not ice visually. Temperature sticks designed to melt at certain temperatures can be applied to the surface of the metal. When their temperature is reached, they melt. All one needs to know is the melting point of the alloy being worked with. It is best to air-cool the aluminum as quenching seems to cause the surface to tear unpredictably. The advantages and disadvantages of T.I.G. Welding: T.I.G. welding feels like wax working. Walls and mounds of metal can be built up just as easily. Two pieces of metal can be joined together and become one with no trace of the join. The inert gas (Aargon or Helium) is blown over the welding area to provide an oxide-free environment for the molten pool (provided by the hot tungsten electrode) and the filler rod. If correct penetration is achieved and amount of filler rod is added, the result is a solid bead of metal. If penetration is too shallow, the join may crack apart or pitting may occur when the bead is filed or carved in refining its shape. Good penetration means that a raised welt appears on the underside of the welded area. This may be filed away afterwards, but in some instances in a design, it is a definite disadvantage. Welding tiny hinge lugs would be quite a good trick. T.I.G. welding stainless steel, copper, silver, etc., is much easier than aluminum, so begin on these metals first. The inert gas replaces the oxygen you breathe somewhat, so take frequent breathing breaks it you should get dizzy. Drinking milk to coat the stomach lining sometimes helps too. Wear protective clothing and proper face and eye shields. With proper, sensible use, this technique is very safe. The machine required to weld aluminum is very expensive, complicated, and nearly as big as my car. In T.I.G. welding metals like silver and copper, a smaller Miller brand Thunderbolt-type machine can be converted to T.I.G. at one third the price. These metals only require a DC current and the high frequency isn’t absolutely necessary, but it’s nice to have for smooth, easy starts and better control. This machine, plus the gas bottle, only requires a space 2’x3’x4′ and can be mobile. The pieces produced in aluminum were purposefully designed to do what no weightier metal could do. An ornament worn just below the knee cap would fall down to the ankle upon the first step if it had been made in another metal. 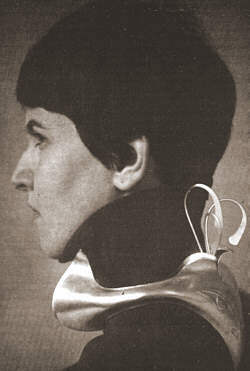 The choker which envelopes the neck and part of the back would be unbearable to carry if aluminum had not been used. 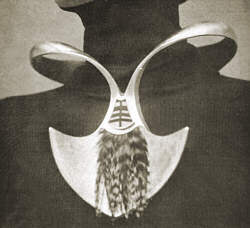 The neckpiece rests on only two parts of the body, yet remains stationary and completely in tune to the body’s movements. In joining the various pieces of the forms together, T.I.G. welding produces an invisible bond which can be filed and shaped to blend into the form or completely disappear. With further exploration and use by the artist/designer, aluminum and T.I.G. welding may greatly influence the products of the future. This article was originally published by SNAG as series of research presentations, which was given at a SNAG Conference, during 1977-1980. Aided by a grant from the National Endowment for the Arts, they were published in 1981 as a single volume called, "The Metalsmith Papers". "Metalsmith Magazine" was being published concurrently.